Growing up, I remember coming back home from school to many comforting meals, consisting of curries and rice. A curry made with many different vegetables, served with ghee rice was one of my mother’s specialities. 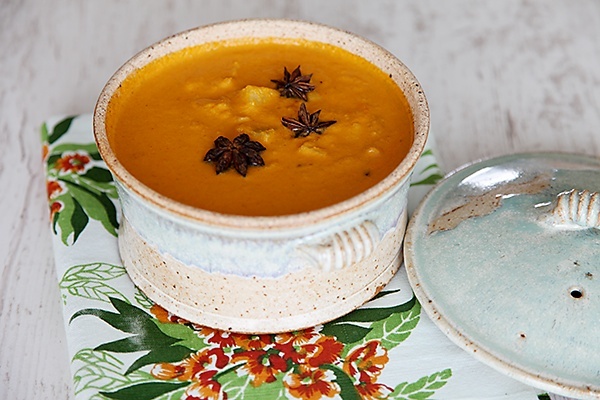 This potato curry, flavoured with star anise and other spices, is one of my favourite curries of all time. I love to cook this with many rice dishes and at times with Indian style breads as well. 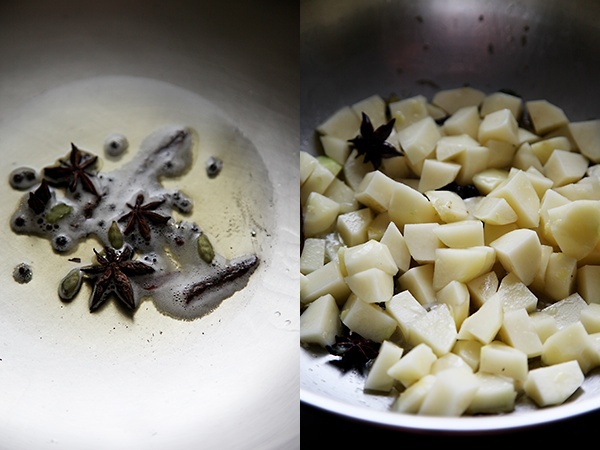 The star anise when fried in oil with all the other spices, releases its special aroma and flavour into the dish. 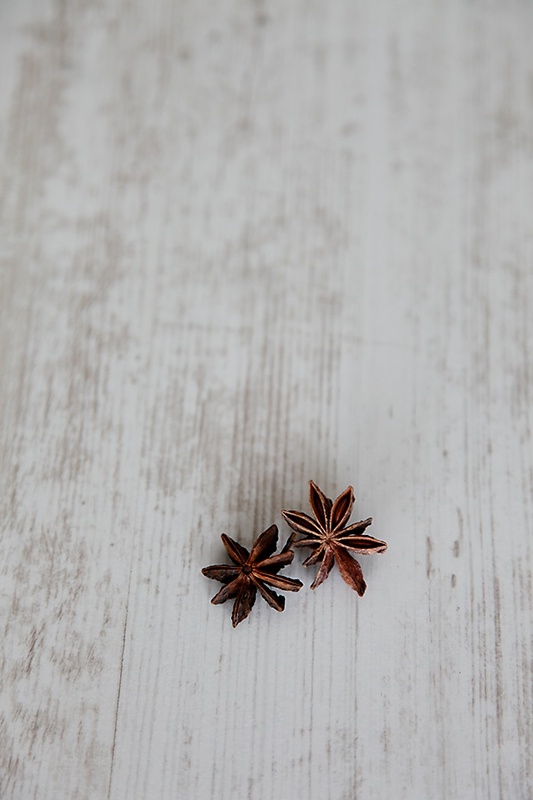 Apart from its charming appearance, the star anise is also endowed with many medicinal and healing properties. I love using whole spices in some dishes and in some dishes I like to bruise my spices a bit and in other dishes, I like to powder my spices. And this depends on my mood, the people I’m cooking for (my brother-in-law hates whole spices) and of course the dish in question. For those of you, who are not familiar with Indian cooking, its important to note that when spices are used whole in a dish, you need to push them aside in the plate, when you start to eat. 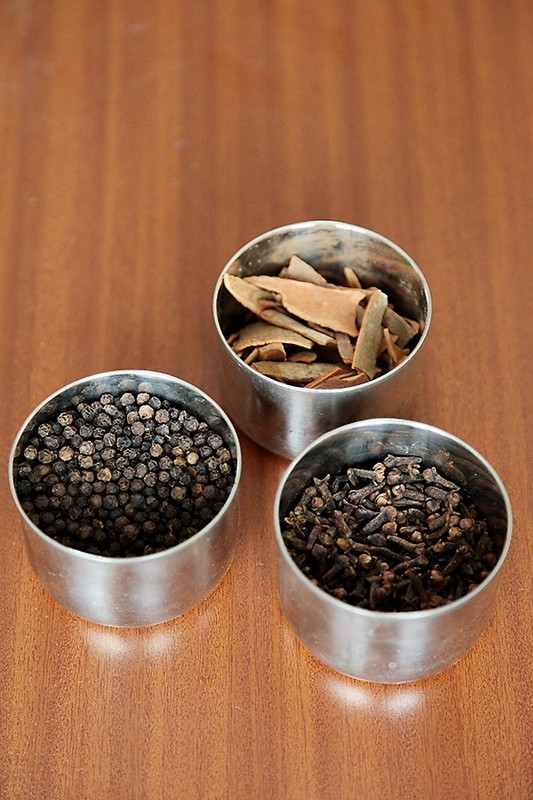 These spices are just meant to infuse the base of the curry or the gravy with their delicate aroma, flavour and taste. I derive an immense sense of satisfaction that goes straight to my heart when I eat a good meal made with a curry like this. And I hope that this potato curry flavoured with all my favourite spices, straight from my heart and my kitchen manages to strike a chord with your heart as well. Trust me, this is delicious and apologies for being repetitive, comforting! The spices in this curry send a lot of warmth not just to the body but also to the heart and soul. 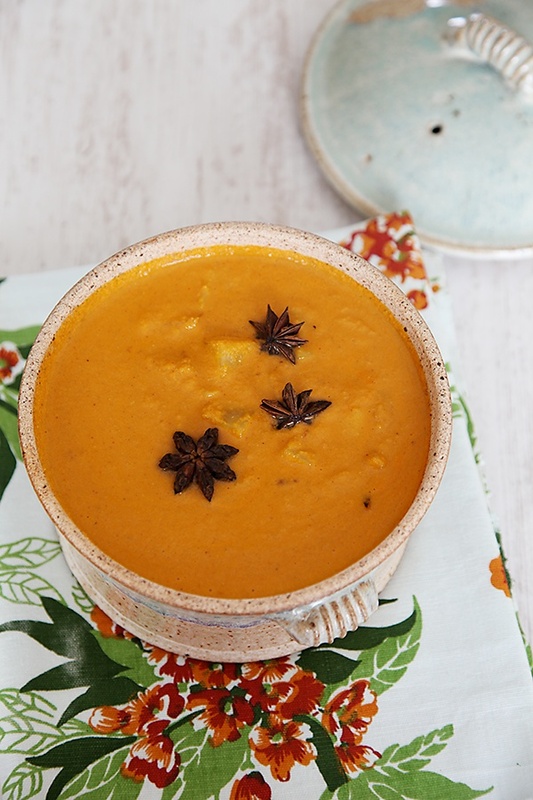 Make this curry and serve it with your favourite rice dish and enjoy! Scoop out the eye from the tomato and place all the tomatoes in a pan of water and bring the water to a boil. After the water begins to boil, cook the tomatoes until the skin starts to peel. Drain the water off the tomatoes, allow to cool down a bit and then peel the skin from the tomatoes. 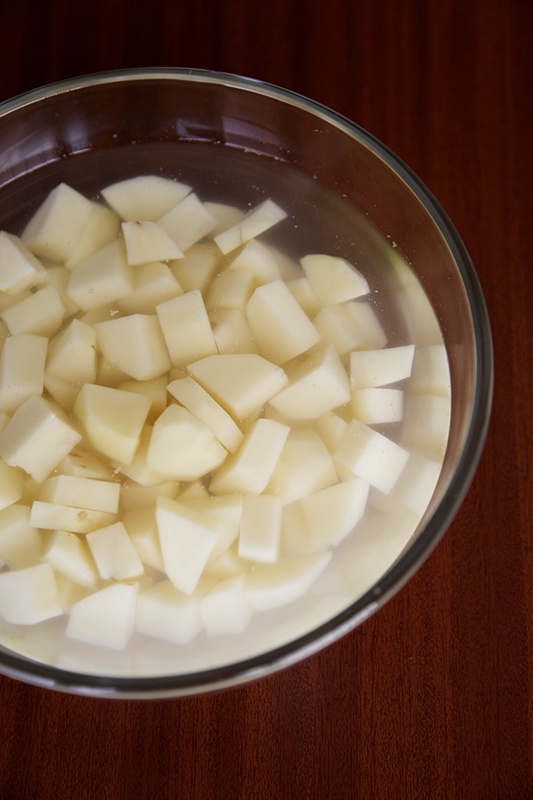 Peel the potatoes, cut them into 1 ½” cubes and place them in a bowl of clean water. This will prevent them from darkening. 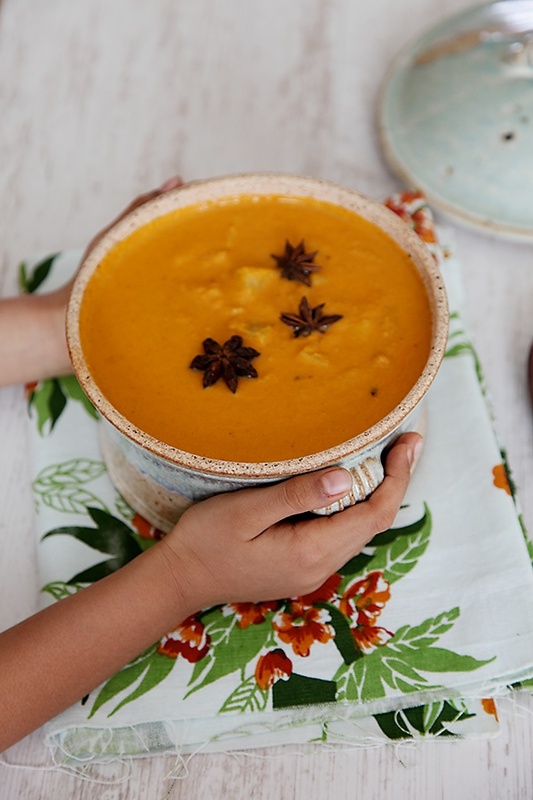 In a blender put in the peeled tomatoes, coconut, coriander seed powder, cumin seed powder, red chili powder, turmeric powder and about ½ a cup of water and grind to a smooth paste. You can add ¼ cup more water if required. In a wok or kadhai, put in the oil and the whole spices, the star anise, cloves, peppercorns, cardamom pods and cinnamon, stir for a few seconds until they release their flavour into the oil, put in the asafetida if using, the fresh ginger and stir fry for 30 seconds more. Put in the potatoes (without their soaking water), stir well until mixed with the spices, cover and cook until the potatoes are tender. This could take about 8 to 10 minutes. 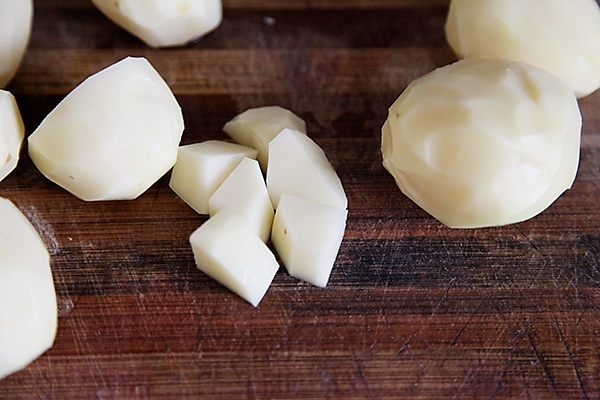 Once the potatoes are cooked, stir in the ground paste, adjust the consistency of the gravy with more water if required and then add the salt. 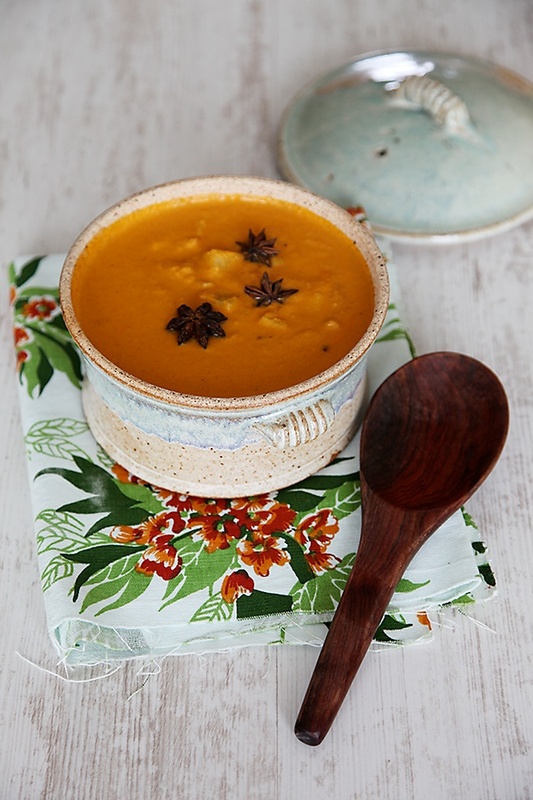 Bring to a simmer and then serve hot with rice or rotis. P.S- If you are making this dish for a fasting day like ekadashi, you cans skip the asafetida. This is an excellent preparation. 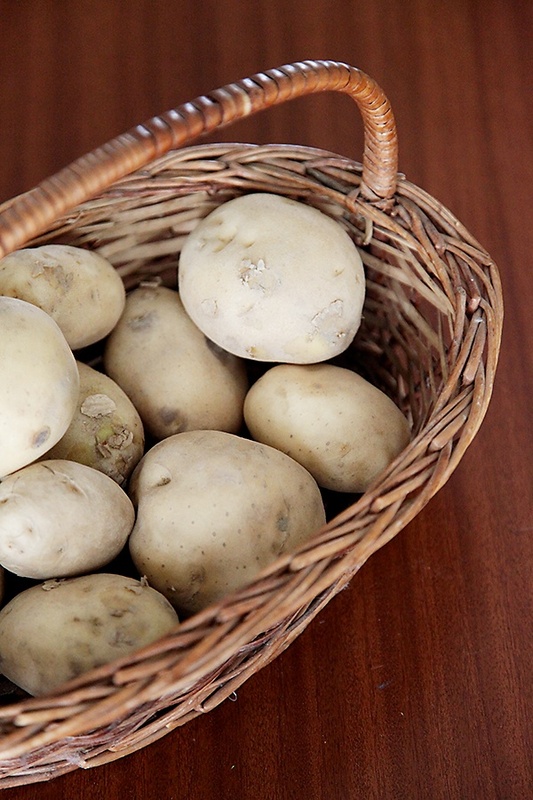 Something quite varying from the regular potato recipes. Will definitely try out and let you know how it turned out! Your new show rocks. Its really nice to watch you cook in your lovely kitchen. I have fallen in love with your all kitchen utensils, tools, ha!!! with almost every thing. Could you please provide the brand name of the black kadhai and spice box that you use on the show and also from where did you get them from? I hope this is not an uncomfortable question for you. I am still awaiting your reply on my last comment. I will be traveling to the Us in two weeks, please let me know the brands of the kitchenware that u use, specially the black kadhai. My sister is getting married in six months, she is a silent follower of your site and she is practically in love with that kadhai. I want to surprise her by gifting her that kadhai. Archana: Sorry for the delay in replying. I think you are referring to my Le creuset wok. Sujoy: Thanks for your feedback. Hope you like this delicious curry!